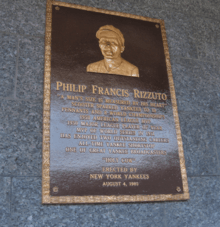 Philip Francis "Phil" Rizzuto (September 25, 1917 – August 13, 2007), nicknamed "The Scooter", was an American Major League Baseball shortstop. He spent his entire 13-year baseball career with the New York Yankees (1941–1956), and was elected to the National Baseball Hall of Fame in 1994. A popular figure on a team dynasty which captured 10 AL titles and seven World Championships in his 13 seasons, Rizzuto holds numerous World Series records for shortstops. His best statistical season was 1950, when he was named the American League's Most Valuable Player. Despite this offensive peak, Rizzuto was a classic "small ball" player, noted for his strong defense in the infield. The slick-fielding Rizzuto is also regarded as one of the best bunters in baseball history. When he retired, his 1,217 career double plays ranked second in major league history, trailing only Luke Appling's total of 1,424, and his .968 career fielding average trailed only Lou Boudreau's mark of .973 among AL shortstops. After his playing career, Rizzuto enjoyed a 40-year career as a radio and television sports announcer for the Yankees. His idiosyncratic style and unpredictable digressions charmed listeners, while his lively play-by-play brought a distinct energy to his broadcasts. He was well known for his trademark expression, "Holy Cow!". Rizzuto's rookie season ended in the World Series, and though he hit poorly, the Yankees beat the Dodgers. The following year, Rizzuto led all hitters, for both the Yankees and the opposing St. Louis Cardinals, with 8 hits and a .381 average in the 1942 World Series; the light-hitting shortstop even added a home run after hitting just 4 in the regular season. Like many players of the era, his career was interrupted by a stint in the United States Navy during World War II. From 1943 through 1945, he played on a Navy baseball team alongside Dodgers shortstop Reese; the team was managed by Yankees catcher Bill Dickey. In 1947 Rizzuto recorded a .969 fielding average, breaking Crosetti's 1939 team record for shortstops of .968. He broke his own record the following year with a .973 mark. Rizzuto's peak as a player was 1949-50, when he was moved into the leadoff spot. In 1950, his MVP season, he hit .324 with 200 hits and 92 walks, and scored 125 runs. While leading the league in fielding percentage, Rizzuto handled 238 consecutive chances without an error, setting the single-season record for shortstops. From September 18, 1949 through June 7, 1950, he played 58 games at shortstop without an error, breaking the AL record of 46 set by Eddie Joost in 1947-48; the record stood until Ed Brinkman played error-free for 72 games in 1972. 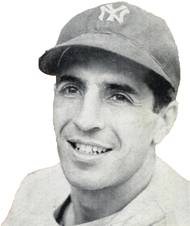 Rizzuto recorded 123 double plays in 1950, three more than Crosetti's total from 1938; it remains the Yankee record. Rizzuto's 1950 fielding percentage of .9817 led the league, and came within less than a point of Lou Boudreau's league record of .9824, set in 1947. Rizzuto's mark was a franchise record until 1976, when Yankees shortstop Fred Stanley posted a mark of .983. Rizzuto married Cora Anne Ellenborn on June 23, 1943; the two first met the previous year when Rizzuto substituted for Joe DiMaggio as a speaker at a Newark communion breakfast. "I fell in love so hard I didn't go home", Rizzuto recalled. He rented a nearby hotel room for a month to be near her. The Rizzutos moved to Hillside, New Jersey, in 1950, to a home on Windsor Way. With later financial successes, they moved to a Tudor home on Westminster Avenue, where they lived for many years. Rizzuto had options following his release by the Yankees, including a player contract from the Cardinals and a minor league offer from the Dodgers. But Rizzuto, who had filled in for the New York Giants' wraparound host Frankie Frisch in September 1956 following Frisch's heart attack, received a favorable response. With his eye on a post-playing career, Rizzuto submitted an audition tape to the Baltimore Orioles. The Yankees' sponsor, Ballantine Beer, took notice, and insisted that the team hire Rizzuto as an announcer for the 1957 season. General manager George Weiss was obliged to fire Jim Woods, who had only been with the Yankees for one year, to make room for Rizzuto in the booth. When Weiss told Woods he was out in favor of Rizzuto, he said that it was the first time he had had to fire someone for no reason. Rizzuto broadcast Yankee games on radio and television for the next 40 years. His popular catchphrase was "Holy cow." Rizzuto also became known for saying "Unbelievable!" or "Did you see that?" to describe a great play, and would call somebody a "huckleberry" if he did something Rizzuto did not like. He would frequently wish listeners a happy birthday or anniversary, send get-well wishes to fans in hospitals, and speak well of restaurants he liked, or of the cannoli he ate between innings. He also joked about leaving the game early, saying to his wife, "I'll be home soon, Cora!" and "I gotta get over that bridge", referring to the nearby George Washington Bridge, which he would use to get back to his home in Hillside. In later years, Rizzuto would announce the first six innings of Yankee games; the TV director would sometimes puckishly show a shot of the bridge (which can be seen from the top of Yankee Stadium) after Rizzuto had departed. Rizzuto was also very phobic about lightning, and sometimes left the booth following violent thunderclaps. Rizzuto started his broadcasting career working alongside Mel Allen and Red Barber in 1957. Among a number of announcers that Rizzuto worked with over the course of his career, Frank Messer (1968–1985) and Bill White (1971–1988) were the two most memorable. Rizzuto, Messer, and White were the main broadcast trio that presided over an important time period for the Yankees, which spanned from the non-winning CBS years through the championship seasons and other years of struggle during the Steinbrenner era. On television, for example, the Yankees broadcast team went unchanged from 1972-82. Rizzuto was twice assigned to broadcast the World Series while with the Yankees. He worked the 1964 series on radio with Joe Garagiola when the Yankees faced the Cardinals. The next time the Yankees made it into the series, in 1976, Rizzuto joined Garagiola and Tony Kubek as part of the series coverage on NBC-TV. The 1976 World Series was the last to have a local voice from each of the two teams as part of its announcing team. WPIX and its usual Rizzuto-Messer-White broadcast trifecta carried the ALCS in 1976, 1977, 1978, 1980 and 1981, providing metropolitan area viewers a local alternative to the nationally-broadcast telecasts. Rizzuto would typically refer to his broadcast partners by their last names, calling them "White", "Murcer" and "Seaver" instead of "Bill", "Bobby" or "Tom." Reportedly, he did the same with teammates during his playing days. Rizzuto developed a reputation as a "homer", an announcer who would sometimes lapse into rooting for the home team. As an announcer, Rizzuto devised the unique scoring notation "WW" for his scorecard; it stood for "Wasn't Watching." During the openings to two separate telecasts, Rizzuto began by reading off a teleprompter, "Welcome to New York Yankee Baseball. I'm Bill White... wait a minute." Both times, this caused White, standing to Rizzuto's left, to burst out in laughter. On another occasion, Rizzuto introduced the team as "Bill Rizzuto" and "Phil White." White: (chuckles) "Well, Beetle's been around a while..."
White: "Got a lot of money—from the Pirates. Put it all in California real estate. That's why he's got that big...uh..."
Rizzuto: "That Healy... I'm gonna throw him right out of this booth. This is the highest booth in the league, too." One broadcast, while still on WPIX channel 11, after a commercial break a shot of the full moon appeared on the screen. Rizzutto, in his clever way quipped, "Look, you can see Texas!" Not all of Rizzuto's broadcasting experiences were jovial. On the evening of the funeral of former teammate Mickey Mantle (August 15, 1995 in Dallas, Texas), the Yankees were set to play a road game against the Boston Red Sox. Rizzuto understandably assumed that he would be allowed to miss the game to attend the funeral with former teammates, but was scheduled to call the game. WPIX and/or the Yankees refused to let him go, citing that "someone needed to do the color commentary." Rizzuto eventually gave into emotion and abruptly left the booth in the middle of the telecast saying he could not go on. Rizzuto announced his retirement from announcing soon afterwards, which many attributed to the incident. He was eventually persuaded to return for one more season in 1996 where he called another Yankee shortstop protégé, Derek Jeter's first home run. When he retired that season, he had spent parts of seven decades—virtually all of his adult life—in the Yankee organization as a minor league player, major league player and broadcaster. Although Mel Allen is to this day identified as "The Voice of the Yankees", Rizzuto was the longest serving broadcaster in the history of the club; he called Yankees games for 40 years to Allen's 35. On September 12, 2006, the New York Post revealed that Rizzuto was currently in a "private rehab facility, trying to overcome muscle atrophy and problems with his esophagus." Rizzuto died in his sleep on August 13, 2007, three days short of the 51st anniversary of his last game as a Yankee, and one month shy of his 90th birthday. He had been in declining health for several years and was living at a nursing home in West Orange, New Jersey for the last months of his life. At the time of his death, at age 89, Rizzuto was the oldest living member of Baseball's Hall of Fame. ↑ Sandomir, Richard. "Phil Rizzuto, Yankees Shortstop, Dies at 89". The New York Times.com. The New York Times Company. Retrieved 12 July 2016. 1 2 Daniel, Dan (1957-03-06). "How Good Was Scooter? No. 1 Shortstop". The Sporting News. p. 3. ↑ Bodley, Hal. "N.Y. Yankees Hall of Famer Phil Rizzuto dies", USA Today, August 14, 2007. Retrieved August 14, 2007. "Rizzuto was still in Richmond Hill High School in 1935 when he said in a New York Times interview he was driven to Ebbets Field in 'Uncle Mike's car — one of those old cars, with the balloon tires' — for a tryout with his beloved Brooklyn Dodgers." ↑ James, Bill (1994). The Politics of Glory: How Baseball's Hall of Fame Really Works. New York: Macmillan. p. 138. ISBN 0-02-510774-7. ↑ "Larry MacPhail Was Wacky Genius". The Washington Times. Retrieved 15 August 2016. ↑ McKelvey, G. Richard (2006). Mexican Raiders in the American League: The Pasquel Brothers vs. Organized Baseball, 1946 (First ed.). New York: McFarland. pp. 65–69. Retrieved 15 August 2016. ↑ Reichler, Joe (6 May 1946). "Mexican, Major League Mixup Goes to Court". St. Petersburg Times. Retrieved 11 July 2016. ↑ Badassaro, Lawrence. "Phil Rizzuto". Society for American Baseball Research. Retrieved 15 August 2016. ↑ Bjarkman, Peter (2005). Diamonds Around the Globe: The Encyclopedia of International Baseball. Greenwood. pp. 277–279. ISBN 0313322686. Retrieved 15 August 2016. ↑ Blevins, David (December 2011). The Sports Hall of Fame Encyclopedia: Baseball, Basketball, Football, Hockey, Soccer. Chapter 18: Scarecrow Press. p. 812. ISBN 0810861305. ↑ Lupica, Mike. "Brooklyn kid turned Bronx icon made us feel like part of family". Daily News Sports. NY Daily News.com. Retrieved 12 July 2016. ↑ Phil Rizzuto calls Roger Maris' 61st home run, Star Tribune. Retrieved May 9, 2014. ↑ Richard Sandomir (2006-09-14). "50 Years in Game Is Enough for Kaat". The New York Times. p. D-3. ↑ , sabr.org. Retrieved May 9, 2014. ↑ Bernstein, Adam (August 15, 2007). "Yankees Hall of Famer, Broadcaster Phil Rizzuto". The Washington Post. Retrieved May 22, 2010. ↑ James, Bill (2001). The New Bill James Historical Baseball Abstract. New York: Free Press. pp. 603–04. ISBN 0-684-80697-5. ↑ Profile, Star Tribune. Retrieved May 9, 2014. ↑ Scooter the Holy Cow, newviewgraphics.com. Retrieved May 9, 2014. 1 2 Kernan, Kevin (September 12, 2006). "Rizzuto fights on in latest battle". New York Post. ↑ "Yankees Hall Of Famer Phil Rizzuto Dies", wnbc.com; retrieved May 9, 2014. ↑ ESPN.com News Services. "Rizzuto, Yankee Hall of Famer, dies at age 89". ESPN.com. Retrieved 12 July 2016. ↑ "Yankees Great Phil Rizzuto Dies at 89", 1010wins.com; retrieved May 9, 2014. ↑ Pearlman, Jeff (August 29, 2007). "Phil and Meat Loaf will always have "Paradise"". ESPN. Retrieved August 28, 2009.